Over time, as we use our laptops/desktop Windows Computers, it gets full after Installing and loading it with various Files, Folders and Data, for example Music, Softwares, Caches, downloaded files and even unknown files. The Answer and Solution is to free up the Memory or Change the entire Local/C: Drive to a much upgraded one. In this post I will show us how we can Free up the memory space of your Local disk or C: Drive, so whenever you're ready, you can buy and replace it with another Upgraded one. 3. A New Window will Pop up, there you'll find System Protection, seen it? Now click on it. 4. There you'll see Configure Settings, Manage disk Space, and delete restore points. 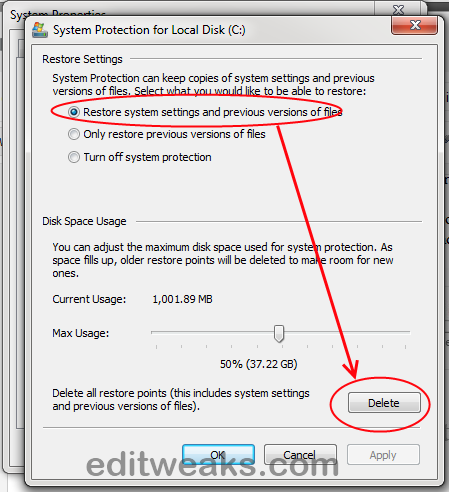 Make sure the Radio Button is Selected at "Restore Settings and Previous version Files"
Your Disk Space usage Limit can be controlled from there too, make sure it is set 50% for Best results. 5. Now move your mouse down, click DELETE - This wipes off all previous versions of old files that is taking up space in the system. Installed Software and Files in your Documents in your PC will not be harmed. Your Local Hard Disk C: Drive's memory is Free now, the Red color displaying on your Local Hard Disk will be gone as you have cleared up most stuff that had been eating up the memory. Please use the SHARE BUTTONS below to spread the word, you might Save another person's Computer with it.